Europeans are facing major challenges. Between the risk of populist contagion and Brexit on the internal level, migration issues and the questioning of their values as well as their interests on the external level, Europeans must find their place in a world where only the unity is strength. These challenges call into question the ability of Europeans to be united in the face of the shocks they face. In such a context, how can their expectations be met, particularly in terms of security and economic and social protection? European integration has freed European states and peoples from the permanent power relations between them; it must now protect them from external constraints. The question now is how. Such a question is at the heart of the 12th edition of the Schuman Report. The highest personalities as well as the best experts chose to express themselves there. The President of the French Republic, Emmanuel Macron, proposed a new European policy in his speech at the Sorbonne. It wants to make European integration an instrument of economic and geopolitical sovereignty with the ambition of giving Europeans all their freedom and a real sense of pride. Unquestionably, France is back in Europe. He delivers here, exclusively, his vision and his analysis of European issues. • an unpublished set of 130 pages of commented statistics on all the major current European topics. 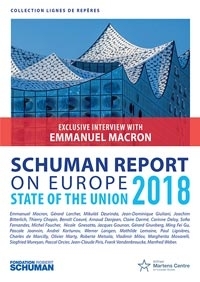 The Schuman Report 2018 on the State of the Union provides a comprehensive view of the European Union. Directed by Thierry Chopin and Michel Foucher, it is published by Marie B in the collection Lignes de repères. Available online on the Amazon website, in bookshops.